Instagram is working on a new tool which would enable users to share posts and Stories with selected groups of friends only, creating a level of exclusivity and intimacy via their personal lists within the app. 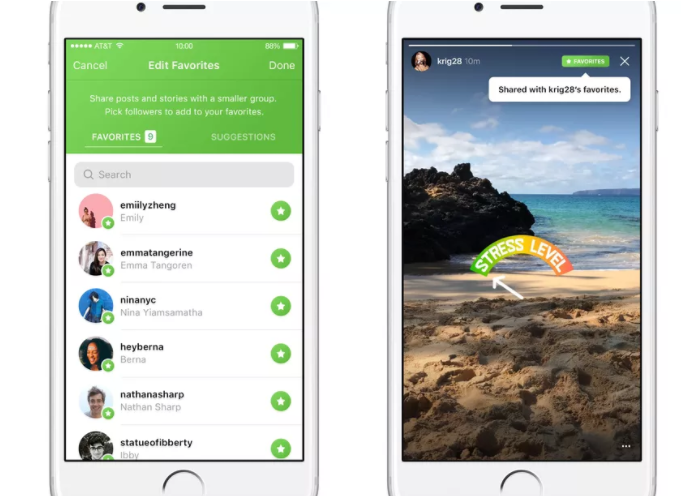 Called simply 'Favorites' the new tool aims to cater to user behaviors - most notably, the development of secondary 'finsta' accounts where users can post their goofy, less than flattering Instagram images only to be shared with their close friends. As reported by The Verge - and as shown in the image above - the option would enable users to create specific lists of their choosing, with the option to share to these lists added to the post flow. If you do choose to share with a list, the post or story would only be visible to these users - viewers will know that it's a private image because of the small, green 'Favorites' note appended to the top right. In addition, users will also get a new 'Favorites' tab within the app which will contain all the private posts you've shared with your lists. Users won't be notified when they're added or removed from a list (though they will see the green marker), and they won't be able to request to be added to a list. If you remove someone from your favorites list, they lose access to any privately shared content. As noted, 'Finstagram' accounts have become an increasingly common trend on the platform, particularly among younger users, with the pressure for perfection becoming an influential element in their platform use. "[Finstagram] completely went against all that Instagram has been for me in the past 2 or 3 years I have been on the social network. I have learned that Instagram posts are an art. It can take a lot of time for me to post a photo on Instagram. I need to decide the photo to post, ask friends for advice on captions, make sure every blemish is not seen, and edit it. I, along with other teens, spend this time because we know that everyone will see it and it can define who you are." The pressure for Instagram perfection came into significant focus in 2015, after teen social media star Essena O'Neill spoke out about the lengths she would go to in order to present a perfect life via her social accounts - a life which is actually far from her living truth. Disillusioned by this, O'Neill had gone back through her old Instagram posts and updated the image captions to reflect the actual truth behind her many 'in the moment' shots. Finstagram accounts reduce the anxiety around posting, the implied peer pressure. And they can also serve another important purpose. Teens can give their parents their Instagram details and share their polished, highly curated collections with them, while posting their more outlandish content on their Finsta accounts for the benefit of their friends. Intended or not, this new tool could help cater to those behaviors, making it easier for users to share in a more intimate, private setting. From a marketing perspective, the addition - if made available to brand accounts - could provide value in another way, giving brands a way to share their posts with specific lists of users based on content relevance, or maybe for exclusive groups and offers. It seems unlikely that this would be added to business profiles, but then again, if the take up is good amongst regular users, it could see an expansion. There's no word yet on a wider roll-out.